Solid breakfast, excellent location, friendly staff! Location was perfect. It was near the main beach, but in quiet location in Sillot. Helpfull staff of hotel. Nice and simple breakfast buffet that may please everyone, it is quite easy to find a place to park near the hotel or in the streets surrounding it. The beach of S'illot is less than 5 mins from the hotel (though it's not the best the island has to offer). Quite cheap price for a place like Mallorca, so it's good if you only plan to stay there a few days (but in another place it wouldn't be a good value for money). The view from my balcony was the greatest part about staying here. And the location was good for the main bus stop and restaurants along the boardwalk. It had a billiards table in the lobby that if I had traveled with friends would have been a great place to hang out. 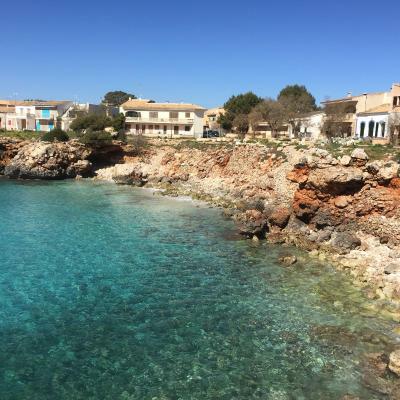 Great location, good breakfast, sea view , good value for money and friendly staff. For such price (25€ per night) and after reading so many bad reviews - I found the hotel just amazing! Everything was clean, super tidy, there was hot water, lovely staff, just on the beach! It was clean and on very good location. Staff was very helpful. Sea view from the balcony was beautiful. The property was situated in a nice area and we had view to the sea. In a quiet location away from the tourist beach and close to the locals but only a short walk from excellent restaurants. Hotel Pinomar This rating is a reflection of how the property compares to the industry standard when it comes to price, facilities and services available. It's based on a self-evaluation by the property. Use this rating to help choose your stay! Located 150 feet from the beach in Cala Morlanda, Hotel Pinomar features simple accommodations with a private balcony and sea views. It offers free parking and 10 minutes of free Wi-Fi per day. Hotel Pinomar includes a bar area with a large furnished terrace facing the Mediterranean Sea. A buffet breakfast is served in the dining room. 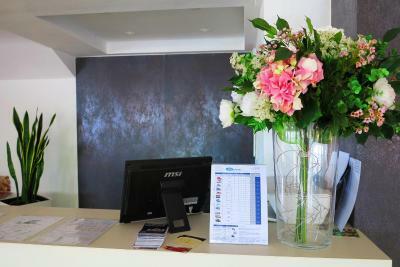 Located on the S'Illot coast of Majorca, the hotel is approximately 40 mi from Palma Airport. Sa Coma Beach is nearby. The tour desk at Pinomar can arrange car rental, and provide information on the surrounding area. When would you like to stay at Hotel Pinomar? This simple twin room offers a private balcony with lateral sea views. Please note that baby cots are not available for this room type. This single room has a balcony, tile/marble floor and sea view. 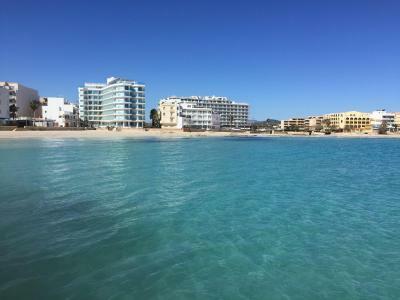 House Rules Hotel Pinomar takes special requests – add in the next step! Hotel Pinomar accepts these cards and reserves the right to temporarily hold an amount prior to arrival. Please note that free WiFi is available in public areas only and is limited to 10 minutes per person per day. Please note all studios are located in a building 350 feet from the hotel, where reception and breakfast services are located. The studios do not have views of the sea. A little too noisy into the early hours some nights - locals not tourists. Good breakfast at the place and very good localization. The room was a bit shabby and could do with a bit of TLC. The strange noises from plumbing at night took a bit of getting used too. But it was clean and simple and the staff helpful. Relaxed atmosphere. Location of the hotel on the seafront and the edge of the town was great. 5 minute walk into the centre along the seafront. Best restaurant in S'illot is the closest to you and overlooks the beach - Es Mollet. If you walk away from town along the coast you are quickly in to wild coastline with great wild beaches - small and beautiful. Boule pitches just outside hotel where the locals play each evening - great to watch. 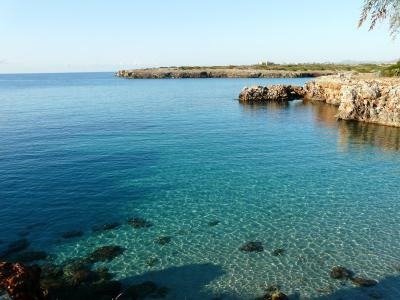 Large serviced and life guarded beach in S'illot and Sa Coma further on but only a few minutes walk away. Much more commercial in Sa Coma, with lots of souvenir and beach type shops, S'illot is more relaxed and has a local feel to it. Great local shops just behind the main beach area and small restaurants and bars. The view was great I liked that it’s located in a more quieter corner. The coffee was good Cala Morlanda is absolutely great and very close by. You get what you pay. You don't expect much if you don't pay much... Breakfast was good. People that work in hotel are really nice and kind, willing to help you when needed... all smiling, love it! And! My room view was the best! The Last nights neigbours , germans not accepted the others ! 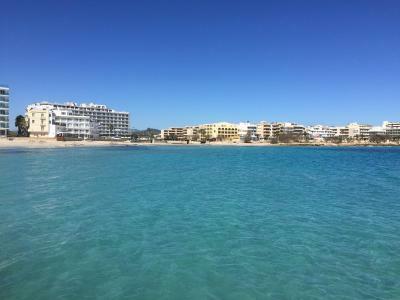 Good position of the hotel , seafront position , excellent breakfast , polite staff, the nearest beaches is only 100 méteres away , two excellent restaurant Es Mollet and Mama Mia within 90 metres away ! In the rooms you can hear everything from rooms next to you, even normal talk! The hotel was worn out. Many of the things at the hotel did not work, like for example the fan in the kitchen. The hotel was near the ocean. We liked everything, and we were very lucky to be the guests that got the biggest appartment in fourth floor with a top-terrace that was huge. Excellent view. The beds were good and the kitchen had almost everything that we needed to make ourselves food. The fridge worked. The water pressure in the shower was great, and it was hot when we needed it to be. It was also great that there was a washing machine. There was a TV with two channels in our bedroom. The kitchentable was good. We had breakfast included, which tasted very good. Overall, we are pleased with the conditions at the hotel in relation to its price. In addition, the weather was very nice and the water was warm and pleasant to swim in.